The Katherine Regional Aboriginal Language Centre was a hub of linguistic activity from 1991 to 2010. 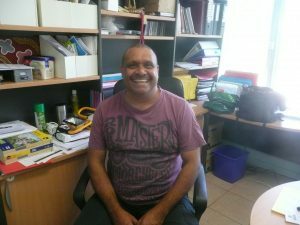 Run by the Diwurruwurru-jaru Aboriginal Corporation, it served all the Indigenous languages of the Katherine region, creating resources and running teaching programs in schools. 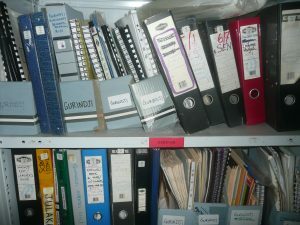 All the materials in the library have been locked away since the centre closed in 2010, under the auspices of Mimi Arts, and last week a team from CDU (Cathy Bow and Trish Joy) and Western Sydney University (Sarah Cutfield) had the opportunity to audit the collection for archiving purposes. 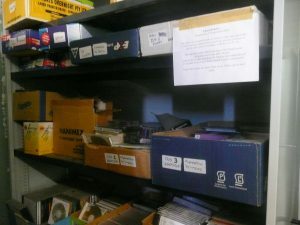 The books and videos and other items on the shelves were stored in good order, but the rest of the room had become a bit of a dumping ground for boxes of paperwork and random AV equipment, so our first job was to clear that out. 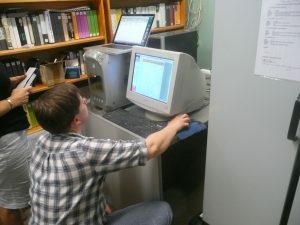 When we were able to access the bookshelves and two compactus units containing the resources, we found them in very good order. 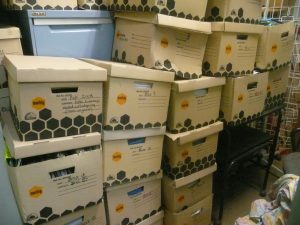 Everything was catalogued and stored in alphabetical order on the shelves. On one wall was shelves of video materials (both VHS and DVD), one compactus had text materials of languages of the region (separated into ‘Kriol’, ‘Eastside’ and ‘Westside’), and the other compactus had multimedia resources (cassettes, CDs, DVDs, minidisks, DV tapes, etc), and a great collection of language and linguistic resources for Aboriginal languages more widely, including languages of other regions, reference materials, etc. There was a Mac G4 computer which we weren’t sure would even switch on. Fortunately it did, and contained a catalogue of materials, but we couldn’t export it or find any way to extract the data, so that’s been taken back to Darwin to see if we can do it there. The library catalogue will be very useful to cross-check with what we found, and help us identify what material may already exist in digital form. We created spreadsheets to record basic metadata for all the items we found and filled them out over the next few days. 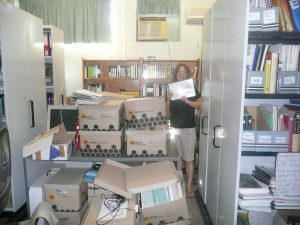 Trish listed over 300 video materials in 30 languages, Cathy documented 560 text materials in 35 languages, and Sarah (who used to work in the language centre) had the job of working through boxes of ‘uncatalogued’ or ‘miscellaneous’ materials – some of which needed language identification. It’s a fantastic collection of materials, including resources produced by the Language Centre itself (readers, story books, teaching resources, etc), plus reference materials (grammars, dictionaries, academic articles), video footage of local events, recordings of old people who have now passed away, collections of photos, reports, flashcards, games – all incredibly valuable for languages which have few speakers left. Special thanks to the lovely Dennis Stokes, manager of Mimi Arts, who made us very welcome in our task, and has exciting plans to reopen the Language Centre and continue the valuable work it did in the past. We also acknowledge Barbara Ambjerg Pedersen, the former manager, who kept the materials safe and in good conditions for years while the centre was not functioning. Also thanks to Caroline Jones from CoEDL for initiating the process of auditing the materials, and to Trish and Sarah for doing the hard yards auditing all those precious materials. This entry was posted in Activities and tagged Katherine on June 15, 2016 by Cathy Bow.